How freaking cute are these?? Adorable! I’ve been saving up wine bottles since I saw this and a few other pins. Tony has started giving me the fish-eye over them, so I figured I needed to start using them. Halloween is my favorite decorating holiday. You can do scary, cute or funny. We add a little more to our decor each year, and we’re slowly branching out into fall decorations. I like candy corn. Not to the extent my mom does, but I do enjoy it. I thought this would be cute for the table, so I bought myself some spray paint. 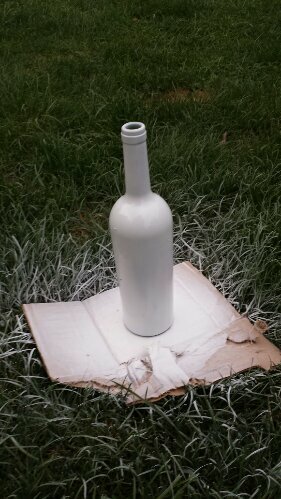 It occurred to me during this process that I have never used spray paint. First mistake I made was not letting the paint dry completely between colors, so I had to repaint. You start with a full coat of white paint. I am still working on my skills with spray paint so there was some dripping. Tony picked on me about it, but oh well, live and learn. Again, be sure to let it dry 100%. Half an hour on a hot day, or an hour if you’re doing this early evening. 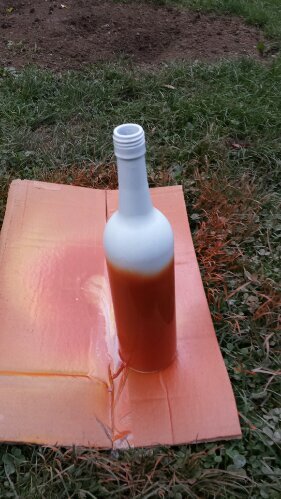 Once your white has dried, spray on your orange from a couple of inces below the neck to the bottom of the bottle. Again, let this dry completely! Final step is the yellow. You want to hit the bottom two or three inches and try to keep your lines even when you’re doing your layers. If it’s not perfect that’s ok. Candy corn lines aren’t always straight either! The original photo, found at http://www.seven12magazine.com/wp-content/uploads/100838479127407506_ygvrG0eM_c.jpg has an orange ribbon tied around the neck, and I may or may not add some later. For now though, it’s a cute addition to my table! 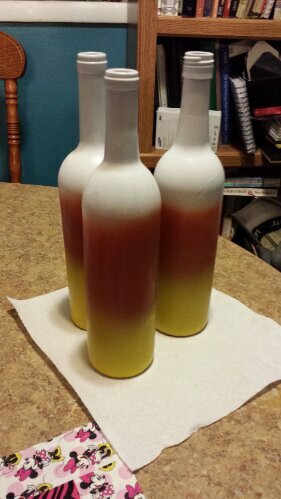 Try it out and let me know how they turn out!